Many learners of English have problems with articles (the words a, an and the), especially when they don’t exist in their own language. This blog looks at some of the basic rules. I asked her for an advice. Note that we use a in front of words that start with a consonant sound (a horse, a carrot) and an in front of words with a vowel sound (an apple, an elephant). He was talking to a man. The man was laughing. She gave him a present. The present was very expensive. Could you shut the door, please? I cleaned the bathroom this morning. He travelled around the world. The sun is hot today. We had lunch at noon. I hope to go to college. He spent three years in prison. My brother’s in hospital (UK) / in the hospital (US). I need to go to the supermarket. She went to the doctor’s. It’s give me advice. Advice is an uncountable noun in English. If you aren’t sure, use the dictionary on this site – nouns with [U] are uncountable and nouns with [C] are countable. Give me “the advice “as well as Give me “advice” is correct because “the advice “means to denots the idea of specific or clear advice about which speaker is already familiar with that “advice ” is already implied to the doer or speaker before time and the speaker is wanting that advice one more . Thanks .. I hop you got it. Both are incorrect, when we use certain uncountable words like advice, we use the phrase -‘a piece of’. Hence it would be “Give me a piece of advice”. I hope that helps. P.S. sorry for being too late. Actually it would be better to say “Advice Me”. Sachin Bedi, I’m afraid your comment isn’t correct. You can say ‘advise me’ but ‘advice’ is always a noun. give me advice would be the correct one. What do you need to know? You can use a piece of advice or some advice. as it was said not to use articles for uncountable words or things like you said advice there are lot’s of advice’s right. Thanks for the help. I am up and running again.. I love all kinds of dogs or I love all the kinds of dogs is correct? You can say I want your advice, Give me some advice, I don’t need any advice or thanks for the advice. Thank you for your useful information. I have a question: what is difference between “a” and “one”, for example: “There is a cat” and “There is one cat”. Pls help to explain this situation. I think all of them are similar. What’s the colour of your cat? – There is a cat. – There is one cat. Both sentences are the same meaning or not? Hi Smiley: ‘One’ is a number. So you would only say ‘one cat’ if the number of cats was important. Thank you for your explanation. “There is a cat” means to me that there is an undefined cat around and “there is one cat” means that there is only one cat around. What is the rule for plural forms? When should I use “The” before a plural noun? You use the before a plural when you have mentioned the things before or if it is clear which ones you are referring to, exactly the same as for singular nouns. For instance: She gave me some apples. The apples were juicy. Dear Liz Walter, thank you very for your answer, it made it clear. I put a few numbers in brackets, which indicate points of my doubts. So, tangle formation is a very specific process, why there is no THE article in front of it (1), the same holds true for (2) and (4). And yet in (3) identification gets THE. While tangle-only disease (5) is not really specified (there are multiple) but here it did not get A.
I will be very grateful if someone helps me to solve this puzzle. Addition to the previous comment. hypothesis (Hardy et al. 1998). How to distinguish when the ing-nouns get THE and when they do not. Please, see examples (6) and (7). Thank you very much for your explanation. I will try my best to implement these new to me rules into my writing. Dear as you said in th above rules that we uses” the” when we going usually to place or shop. he is going to the shop. then why you told the we don’t use the before college. Thanks ! After many years of self study in English , it’s noted that grammar and compositions knowledge is a must in order to feel exactly what the presenter means . i want to learn voice. Plz share a blog of voice wid us. It’s quite a clear and useful explanation. Thank you! I’m in love with your classification attitude in explanation an issue. Nice one there. I love it. ” Pleasure” is an uncountable noun so it is not preceded by ‘a’ but when it is modified by an adjective then ”a/n” is used before it.Why? With the word pleasure, it depends on the way it is being used. Some uses of pleasure are in fact countable. (you can check on the Cambridge online dictionary). In a sentence like ‘It was a great pleasure to meet her’, it is countable – you are referring to the single event of that meeting. However, there is a wider and rather advanced point here, which is that many uncountable nouns can be used in a countable way in a somewhat literary or formal style if they are preceded by an adjective, e.g. : Her face showed a terrible sadness./They displayed an ugly racism. Which article is correct in the sentence:He goes to—University every morning. You don’t need any article there, just: He goes to university every morning. I would use ‘an’ for both of these. While I agree the first one should be an, because M is pronounced em, I think the second could depend on whether you pronounce H as aych or haych. 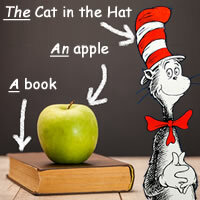 Students often think that letters follow the same a, e, i, o, u rules, but it actually depends on the sound of the letter. an A, a B, a C, a D, an E, an F, a G…an L, an N, and so on. you are an English lessons. hi i does 9an5 make sense? i wanted to register 9and5.com but it was taken. 9 and 5 are characters i created. so instead i got 9an5. does that work? thank you! It doesn’t make any sense to me, I’m afraid, no. What do you intend it to mean? Thank u! for your useful information. Thanks for your useful tips. My question is on when to use “on” and “at”. HE IS AT LUNCH OR HE IS ON LUNCH? In British English, we say that someone is ‘at lunch’ or ‘on their lunch break’. If you say, she is a European and who says she is an European. Who is collect and why. I’d say ‘a European’ because the sound is like a consonant (sounds like ‘y’) even though the letter is a vowel. In many books since my childhood I have been reading that “The cow” Is that imply any specific cow or in general “All cows”. Mostly people write “The” in beginning of a sentence, may I know why? Yes, you can use ‘the’ to talk about a group of things in general, e.g The cow is a farm animal. However, this is a rather formal use. And you should say ‘In the beginning’ if you are telling a story, or ‘At the beginning’ if you want to talk about something that happened at the start of something, e.g. He comes on at the beginning of the play. Thank you. What about the letter’u’? Is it a uniform or an uniform? It’s a uniform because ‘u’ is pronounced /ju:/, but it’s an umbrella. how can i improve in english??? What would be correct “A Pashupatinath” or “The Pashupatinath”? Hi, can you please help me with this sentence. She wants the answer to all her questions or she wants an answer to all her questions. Hi Dorine, Both are fine. Thank you very much dear Liz, really you made me understand many grammaratical points. Very nice lesson. It was most helpful for me to get better understanding about article. he is the best boy in class. so useful !!! truly helped me a lot . examples worked a lot to clear few confusions !!! thanks a lot Liz !! For example even in that text I see line which consist: “and *the* following are the most useful ones to learn”. Why did you use “the” in the first time? About situation like this I don’t see in that lessons. It’s an example of what I described like this: ‘We also use the when it is obvious which thing we are talking about or when there is only one of something’ So in this case, it’s obvious what we are talking about when we say ‘the following’ – we know that we mean the things that we are just about to read. It’s useful to learn that phrase ‘the following’ because we always use those two words together – it can never be ‘a following’ because that wouldn’t make sense. If there’s only one manager, it’s ‘the’. If there are several managers, it’s ‘a’. Because headache is a countable noun. Hey liz will u be able to take lessons online using skype ?? Thank you very much for your explanation.. Thanks for this lectures, I learned a lot. Will you please send me the 71 thoughts on A, AN and THE. How to use articles in English. What article comes before the word stick? a or an? for example ” give me a/an stick”.please explain. a stick: Note that we use a in front of words that start with a consonant sound (a horse, a carrot) and an in front of words with a vowel sound (an apple, an elephant). I’m pleased you like it! Just click on my name in the right hand column and you will find lots more posts like this. It all depends how you are using those words. So you can say: ‘He owns a horse’ but then ‘The horse he owns is black.’ I’ve tried to explain this in the post – maybe try reading it again? Good luck! An/-/The early bird catches the worm. Which article will be used here? Most likely ‘the’ because it’s a fixed phrase. i have a question about “in hospital” and “in the hospital”. Does it just have difference between UK Eng. and USA Eng.? I remember that “in hos[ital” means one is ill and has to be in hospital. However, “in the hospital” means one just go to a hospital, i mean maybe just go to that place. Yes, as I say in the post, Americans usually say ‘the hospital’ where Brits just say hospital. So Brits say things like ‘You should go to hospital’ or ‘She’s in hospital’. We’d only say ‘the hospital’ to talk about a specific hospital that we’d already mentioned ‘The hospital was close to her house’. You’re right that they are both correct. I don’t think there is any difference. I’m not sure why you can omit the article in this case, when you couldn’t say ‘because he is teacher’. Yes, this is correct. We can always use ‘the’ to refer to a specific thing that has been mentioned before. And yes, you can say ‘a lunch/dinner/breakfast of’. So I should have said that we ‘don’t usually’ use an article before meals. It’s a common learner error to say ‘I’m going for a lunch’. How to get more knowledge from you? Why is there no article? Thanks for your question. We say ‘Books are important’ because we’re talking about books in general, rather than specific books. We could say, for example, ‘I have read all the books in the library.’ In this case, we use the because we’re talking about those specific books. Love is more important than money. Thank you very much, that was a very useful lesson! Have an agreeable day! Regards from Hungary! I have a question. in the sentence: “What language do you speak best?” We don’t put “a” before language. I know it’s right just because it feels right, but I cannot explain why. Can you help me? It’s simply that we don’t use articles after wh- questions. i have a question, when do we use of? Have a look at the entry for ‘of’ in the dictionary on this site. Sorry, I can see why that was confusing! I was just trying to explain the meaning of ‘countable’. We don’t use a or an with plurals. can someone help me please. should I say my television have a problem or my television had a problem. If you mean now, it’s: My television has a problem. If it’s in the past: it had a problem. Never ‘have’ because that’s for plural nouns. Which one is correct – “a unique program” or “an unique program” ? a unique program – because although ‘unique’ starts with a vowel, the sound is ‘ju:-‘ , i.e. not a vowel sound. U can use “an” where the word starts with A,E,I,O, & U remember these five consonant. a.”A cheese is made from the milk”. b. “She always keeps promises that she makes”. Dear Parinitha. If you read my post carefully, you will find the answers to those questions. However, I’m not sure you’ve written them down correctly – for the first one, there is an error in the question, but no error in the sentence. There is also no error in sentence b of the second question. Dear Roksana – what sort of particles do you mean? I’d have to know the context. Could you correct for me the sentence: “It is unable to negate the benefits of the Government policies on (the) rice self-sufficiency and (the) rice land maintenance to ensure the national food supply, disaster recovery, and other security and defense goals”. I am very confused. Thank you very much. As explained above – it depends on whether or not you’ve already mentioned the city. But most likley ‘a’. Avenger is a special car. Would you say, “I drove Avenger across the finish line” or “I drove the Avenger across the finish line. Which one of the below statement is correct. 1.) We have a plan. I hope that answers your question! Thank you. To be frank got bit confused whether plan is countable or uncountable . I see. If you are unsure, check the dictionary on this website. Every noun has [C] or [U] after it, which tells you that information (although some nouns are marked [C, U] because they can be used both ways. Dear Liz Walter! Could you help me with a question? The sentence is: “I can go home on a train, a plane or a ferry”. Is it necessary to use article “a” thrice, or maybe, it is enough to use “a” before the first noon? Good question! Once is enough. In fact, we’d probably say ‘by train, plane or ferry’, but ‘on a’ is fine too. The birds are singing in the trees. thx for this lesson ..you said that the indefinite articles ” a and an ” used only with countable singular nouns . Yes, these are phrases for quantity, and always used in this form with the indefinite article. I’m studying grammar on my own. In the following sentence, I’m trying to identify the cases of noun. “Depth in philosophy bringeth men’s minds to religion.” Is “Depth” nominative case, a subject of verb “bringeth”; philosophy objective case, object of preposition “in”? Thank you for your help. I have no one to ask. Hi Wynn, I’m afraid we can only respond to comments that directly relate to the blog posts. Reblogged this on Philip Sanders. Which is correct: sing a song or sing the song? It depends if you’ve mentioned the song before or if you know which specific song it is. So: Tom’s going to sing a song. (we don’t know what song it is) He sang the song very well. (that specific song, which has already been mentioned). Thanks, so is it correct to say…sing the song ” Ten Little Fingers”. like that…. That’s interesting – I’m not sure, but I think it’s probably just something put into songs to make them sound jolly! Maybe another reader has more information? this is very useful ..
i want know when i can use this words (really, very, completely, absolutely, and consequently). how i can know the answer. and i thank you again for your help in the words (a/ an and the). My student is in 3rd grade. She is being tested on A, An and The usage. The quiz only has phrases or words. I can understand this method when deciding to use A or An, but not with The. Doesn’t there need to be a sentence to tell which? “orange umbrella” could be An orange umbrella or The orange umbrella. … depending on the rest of the sentence. I want to buy an orange umbrella. or Please pick up the orange umbrella. Thanks! You are correct. I imagine that they expect your student to write ‘a’ or ‘an’ in all cases except where the answer is always ‘the’, e.g. the sun. Thank you … that makes sense. (except THE was given as the correct answer to “orange umbrella”. Am I missing something? ) Is there any other way to tell with THE other than it is always one (like sun) or from the rest of the sentence? Earth was another one… so that would be THE earth, since there is only one? Also, THE ocean? (though there are more than one ocean?) Thanks again. I think that was just a bad exercise! Good evening , I have some problems with using “a ” – I ‘ve met a sentence ” Where can I have a coffe” or ” Can I get a tea without sugar ” or ” How much is a tea without sugar ?” so ..tea or coffee is uncountable noun or may I use it as a cup of tea or coffee? Coffee and tea are countable nouns when they refer to one cup of the substance – I’m preparing a post on precisely that, so keep reading! You cleared all of the doubts which i have been striving for months… Mam can you please share me the link of correct usage of ‘on’ ‘at’ ‘over’. It would be appreciable. This is a great teaching and is indeed impactful and educative. It seems more difficult when it comes to not using articles, i mean omission of artcles. It would be great help if we get some info. about that. Please let me know why the word ” is explained in the way shown below. I can’t understand the phrase ‘a body of a human’. Why isn’t it explained as ‘the body of a human ‘? why we used ‘the’ in front of ‘school environment. This is tricky to answer, especially without seeing what came before, but we do sometimes use ‘the’ for general things when we think of them as being a single thing – i.e. the general concept of the school environment. It would not be wrong to use ‘a’ in this sentence. He’s often quoted in the media and conducts empowering workshops around the country. In this case, why (in the media) is used, Why not (in media). Good question! It’s because we think of all the newspapers, TV stations, magazines etc as one group, so there’s only one of them in the world. We do the same when we talk for example about ‘the police’. So just to be clear, you do need to write ‘the’ in front of ‘media’. i really recommend this, very useful. thanks very much. Shot on Go Pro Hero 7. Shot on the Go Pro Hero 7. I have no idea! Is this game talk?? I teach English as a second language. Your explanations are simple to understand, unlike some grammar explanations that tend to be too clinical. While I am from an English school. But as I never paid attention during my school days, It made me weak in English grammar. But thank you for this comprehensive article. Thank you very much for this very easy and interesting lesson ! Am enlightened. Thank you so much. Dear Liz Walter, thank you for the article! In order to understand the articles usage, I have read the article in The Journal of Navigation (2014, 67, 311-326). I brought my particular attention to the situations when a noon is concretized with prepositions ‘of’ and ‘for’. The examples are as follows: ‘… a wave of rapid innovation … ‘; ‘… the requirements of a range of …applications … ‘; ‘… by the adoption of a standard format for recording measurement data …’, ‘… provide an ideal platform for cooperative … positioning …’; ‘… the production costs for low-performance …’. It seems like the ‘concretization rule’ by prepositions is more applicable for plural and uncountable nouns, because the extent of indeterminacy for each case is approximately the same. Thank you so much, Liz! I have learnt alot from here. Here is my question though: Are there words you can say without putting an article before them? If yes, what are those words? Thank you! Uncountable nouns and plural nouns and a few specific nouns e.g. prison, as explained in the post. It seems the 2nd sentence is not idiomatic though college and university are both educational institutes: get into a university/the university (of my choice)/ the University of Utah (the full name) are better choices. I have the idea after reading posts online and wonder what is your take on this?? Both of those sentences are fine, if you just mean that you want to go to any university. It would be possible to say ‘a university’, but that would have more of an implication that you would accept any university that would have you! What can we learn from emails?